For the final day of cooking Root Vegetables, I decided to make my most favorite one of all, the Taro Chips. If one is to ask me what I love the most, I would anytime say its Seppankizhagu Varugal with Sambar. It was my growing up food combo and it has stayed the same, though I hardly ever get to make this combo these days. Yes one gets to enjoy all they can in parents home right and Amma has always cooked everybody’s favorite dishes all the time. When I think about it, I do wonder how she managed. Though seeing how my kids are demanding, she says we were never like that and her life was so simple and uncomplicated, I think its just a feeling. Because I do remember she always used to have my favorite food most of the time and because it never aligned with what my brother eats, she used to make his favorite food too and come to think of it, she used to make special dishes for Daddy as well. happy seeing how Peddu loved this and wanted this to be made henceforth. He said he doesn’t want potato chips anymore for lunch. Sambar and Curd rice. Well one can dig in as such too. Wash and drain. In a pressure cooker, take the vegetable and fill with just enough water. Pressure cook for a 1 whistle. Make sureyou switch off after 1 whistle as we want the tuber to be firm for slicing. Allow the pressure to fall down and with dry hands, peel off the skin. Slice into thin circles of 2 cm thickness. Sprinkle salt and red chili powder. Heat the kadai with oil and when hot, deep fry in batches. Remove using a slotted spoon when cooked on both sides, drain on to a kitchen towel. 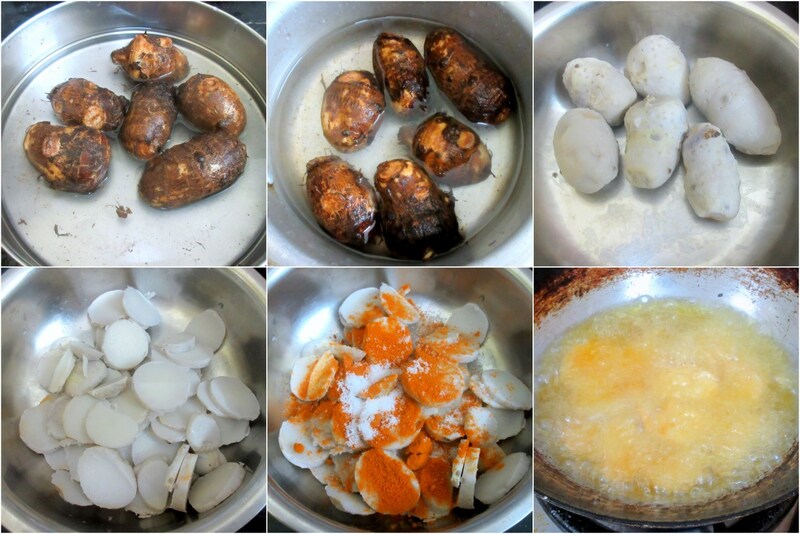 Serve with sambar rice or eat as such. We can have many variations to the deep fried chips. You can use sambar podi, coriander powder etch. will also prevent your oil getting steeped with spice powder. quantity as otherwise you will end up making the oil coloured. Now you have a reason and an excuse to cook you favorite food since Paddu also likes it. It left me thinking too , how mom used to manage us , and our life was filled with all the exotic bakes and traditional dishes and yet she made all pur favorites ! Having taro chips as part of your daily menu is healthy . Oh we make these quite often and my they are addictive ! Good you reminded me , haven't made these in a while . I have never tried taro root chips .Those looks delicious . 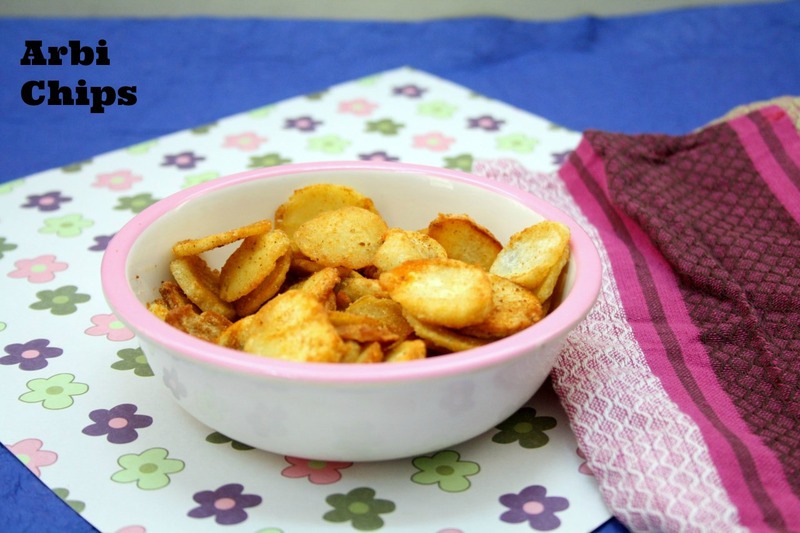 Simply love this taro chips especially with rasam rice, my all time fav. My favorite combo Valli,Sambar rice and taro fry.Taro chips looks so addictive.. This is a perfect side for any variety rice.. These are just so addictive and you cannot stop with one! I usually don't deep fry them, so they are slightly on the softer side. 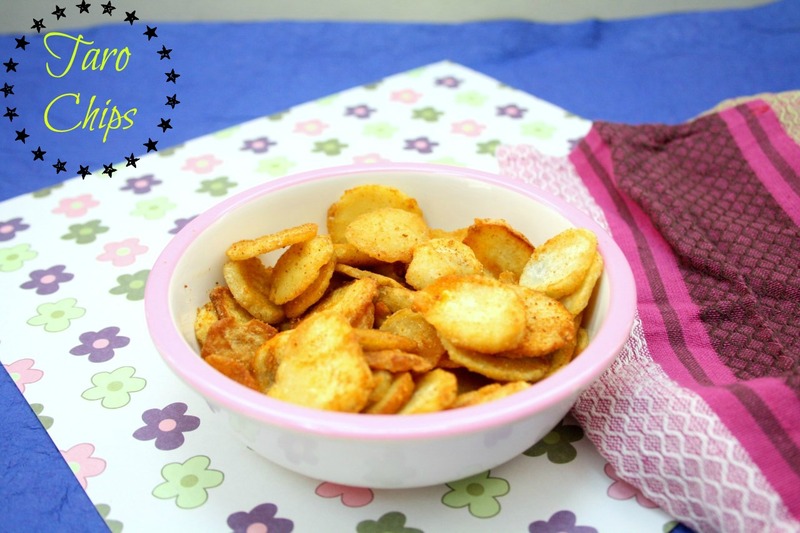 Need to try this deep frying..
What an addictive and delicious looking arbi chips. My kids would LOVE these. 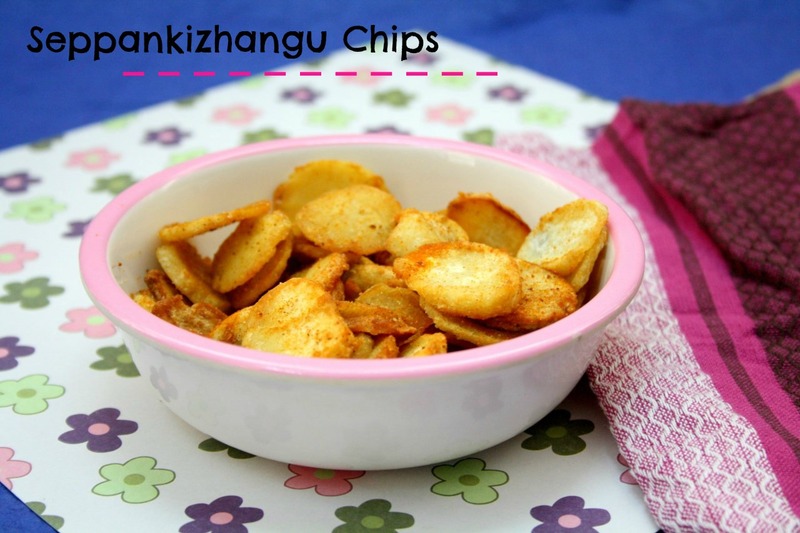 I have only recently started using taro at home and I have tried the baked version of these chips and I am sure the fried version is just as addictive!